Keystone Super Savings Going Fast! Some of the biggest savings of the year on lodging and lift tickets are happening right now!…Like right, right now! 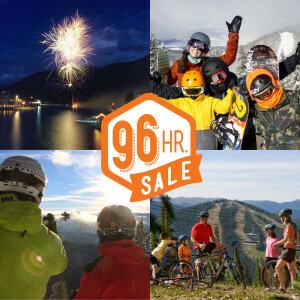 Our 96 hour sale has started with offers of up to 60% off lodging for the rest of spring, all of summer, and into next winter till the holidays. This is the best lodging deal of the year! Plan a last minute trip for some spring skiing, especially with our lift ticket deal (listed below) happening now too! Plus all our regular deals are still on, like Kids Ski Free with a stay of 2 or more nights. Plan ahead for some summertime fun, this Wednesday marks 100 days till we open for summer. Plan way ahead for some some early turns at the start of next winter. Also from now till Friday March 6th, get your daily lift ticket for the discounted price of $85! That is the best value in Summit County! Purchase your ticket online and enter in the promo code KEYSKI. Hurry, both amazing deals end on Friday at midnight!